Continuing the Blood Bowl retrospective that started last week with my Goleen Gladiators halfling team, today its the turn of the Roughnecks. 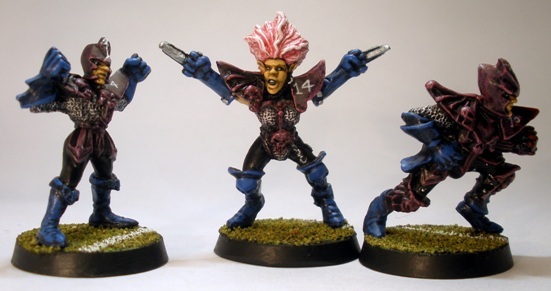 I painted this team in 2002. I was very short of cash at the time (a regularly recurring theme throughout my life unfortunately), but I was time rich. 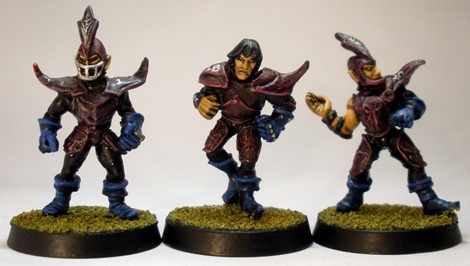 As a result I decided to go through my big box of old Blood Bowl figures (some of which had been sitting there since 1989) and attempt to get through painting as many of them as possible, as fast as possible. 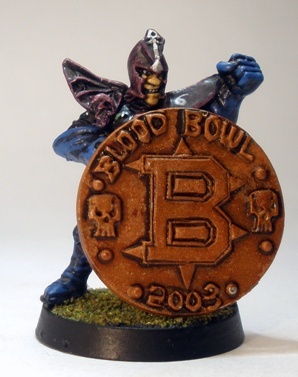 Appropriately this speedy Blood Bowl push began with a skaven team, the fastest team in Blood Bowl. 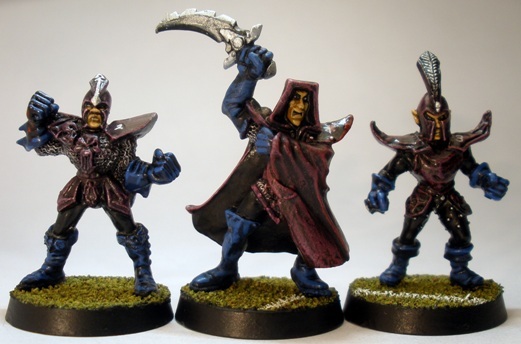 The team is a mix of second edition BB figures, third edition BB figures and a couple of old WHFB rat-ogres. As is often the case, I overdid it a little by painting up maximum numbers of most of the positions. Still, its better than only painting twelve guys and ending up always fielding a couple of half finished players later I suppose. The colour scheme was decided upon for speed of application more than anything else. 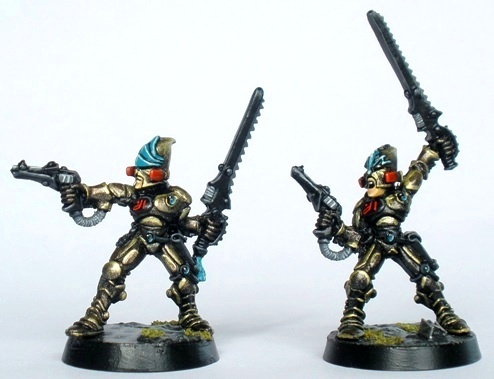 The chosen uniform colours were applied as a couple of washes over a black through grey to white drybrush. The fleshier tones were layered on in a slightly less down and dirty fashion, but it is very much a “tabletop quality” paint job. I added some metallic scuffs and dents to the figures, but it was a bit crudely done. Most of the marks look like genuine real life damage to the miniature paint job rather than scaled down wear and tear from a Blood Bowl pitch, which isnt ideal. The grubby greenish yellow worked well I think. It was easy and rapid to apply and still gives an interesting and slightly unpleasant pestilential look appropriate for rat/man hybrids. I enjoyed playing skaven probably more than any of the other teams that I have played Blood Bowl with. Elves are fun to play for sure, but the cost per player involved makes the first few league games knife edge stuff, plus starting teams tend to have few position players, which can make them a little bland. Neither of these issues affect rat-dudes as the skaven lineman is arguably the best in the game: fast and cheap and easily replaceable. While just as fragile as wood elves, skaven teams have a safety net of reserve players that makes coaching them slightly less stressful. Skaven dont have AG4 across the board of course, but they have it where it counts. The Roughnecks (who have had their name prefixed with a variety of local area names that begin with “R” over the years. Its currently the “Reenascreena Roughnecks” simply because its a funny sounding local place) have played most of their games in familiar, sewer like, underground confines of dungeons. This happened back in 2004-2005 or so when MT, SOS (AKA theottvonbismark) and I played a very large number of three way, five-a-side dungeonbowl games on a variety of dungeon maps. Our Dungeonbowl variant made a small number of rules changes to the 3rd edition Dungeonbowl rules as written, but nothing very radical (other than turning the game into a three player affair, which while not too crunchy in rules terms, was a big change in play terms). During that time the three of us leveled up a large number of teams in that rather absurd, potentially maybe a little bit too random but consistently hilarious environment. It counts as my best Blood Bowl experience bar none. Three disease-ridden mutant rat people get the party started. I recently found a document containing a list of the house rules that we used for our Dungeonbowl games. MT still has all of the old team rosters too, which I am sure make for an amusing and nostalgic read. A return to the dungeon may well occur at some point in the future. 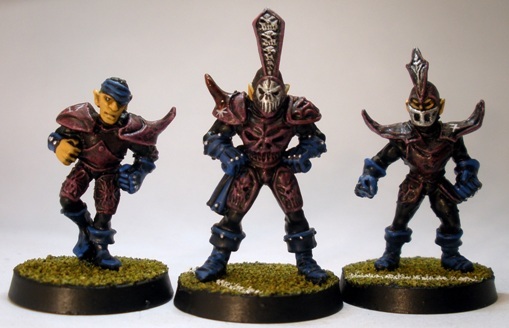 I coached the Roughnecks through a large part of this Dungeonbowl period, making them probably my favourite team, although its a close call between these squeaky little guys and one other team, of which more at a later date. 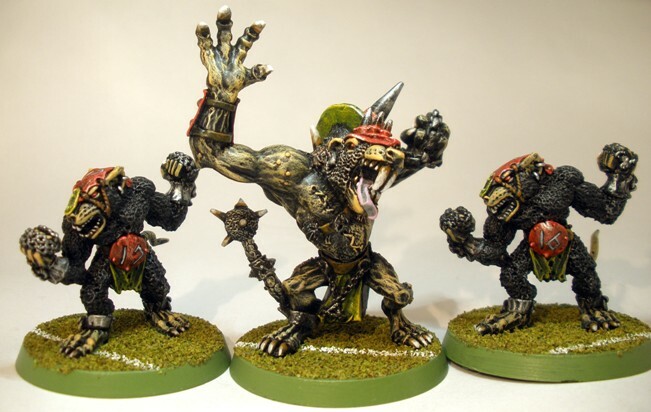 I am not sure at what point it seemed like a good idea to end up with three Blood Bowl rat-ogres, but it happened. 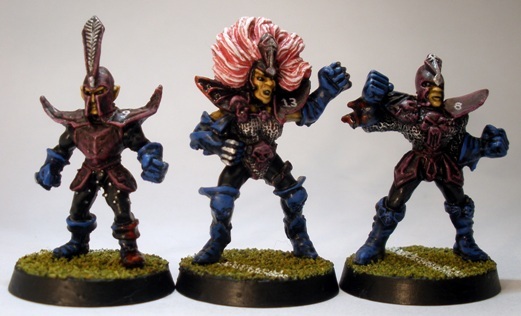 Funnily enough I think that the old hairy rat-ogres look a little more like Blood Bowl players than Headsplitter (centre) does. 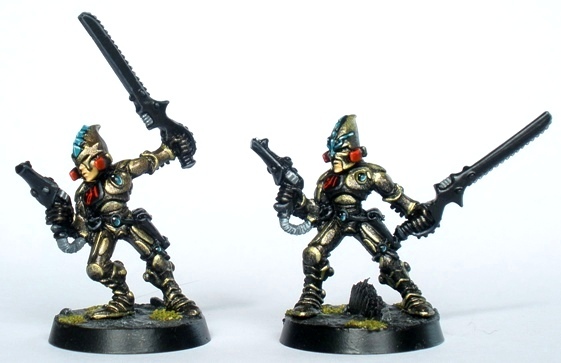 Squad Seth was painted up in 2002 along with most of the rest of my Iacon Eldar. The concept was vaguely Egyptian themed, for a few different reasons. I am not a Stargate fan but I do like the look of some of the elements. Nonetheless, Stargate wasnt really an influence. Mostly the colours chosen have Egyptian relevance. Gold is the colour of the flesh of the Egyptian gods. Lapis lazuli/faience (the turquoise/blue) is a common feature of Egyptian decoration, as is red. Each squad is marked with a unique glyph. While I used hieroglyphs as reference when coming up with these, they are not really very Egyptian in look. Thats fine really though as while I like using that imagery as a reference, that is all it is supposed to be: a reference. These guys are supposed to be spacemen after all. Some of the glyphs worked out better than others. Painting bright red detail on black like that was time consuming. 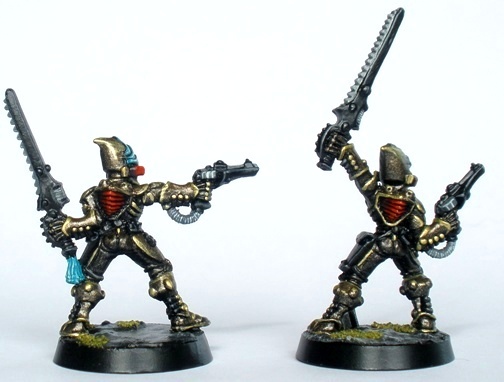 Another element of the Iacon force was that I used a lot of Dark Eldar parts in with the regular Craftworld bits. While this was justified conceptually it was mainly just because I wanted to put together some stuff that wasnt directly off-the-peg. Additionally the variety helped to keep me interested while painting. 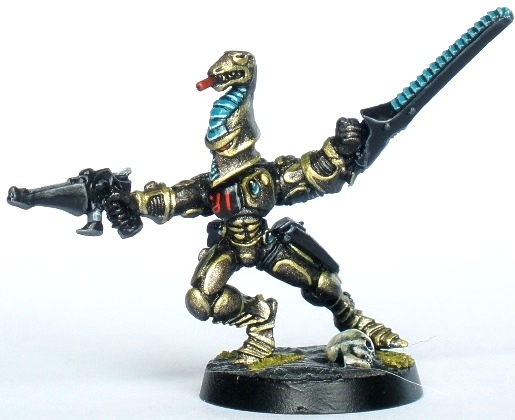 Part of the concept was to make the Aspect Warriors bare headed. 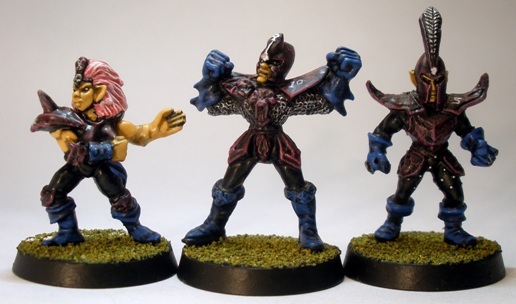 As the helmets are an intrinsic part of the Aspect Warrior concept, using different heads was going to make the Iacon Aspect Warriors unique immediately. It was a lot of work chopping off all of those heads and replacing them with others, something that I am not going to be in a hurry to do again. Rear shot showing armour banding. 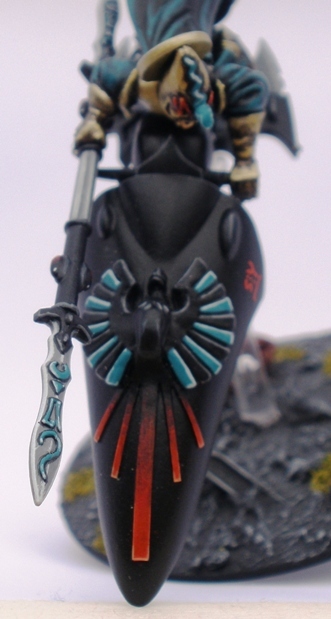 The concept of these Eldar walking the line between light and dark which is pursued a little via the bare headed Aspects, was pushed a little further with the Exarch. 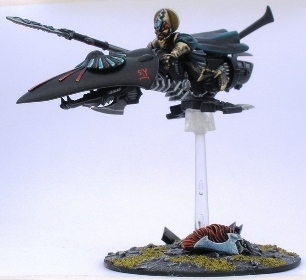 The Dark Eldar Incubi are essentially a “dark aspect”. 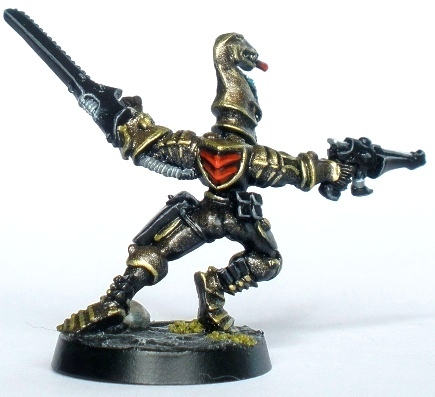 This origins of the dark aspect come from the only Eldar Phoenix Lord to turn to the dark side: Ahra, Father of Scorpions, the Fallen Phoenix. Incubi have tall helms with a blaster mounted on the top that functions similarly to the Striking Scorpion Mandiblasters, so I went with a similar look on the Exarchs helmet. Looking back at these guys I quite like how they turned out. Painting the gold areas was a huge chore however. 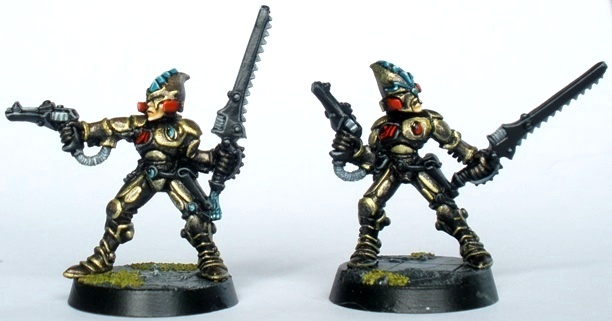 Even if I had the patience to go to all of that trouble converting those figures again I would approach the painting of the gold areas very, very differently and probably more effectively now. I still think that the gold areas mostly look good, but they dont really reflect the large amount of grief that they caused me. Despite all of the hassle that I had with these guys I do get a kick out of taking a look at them again some years later. 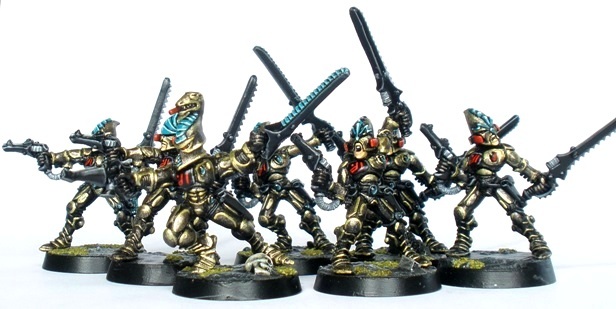 I think that they are a cool looking unit and there is something about the slightly unusual colour scheme that I like. Squad Seth gets ready for ritualised bloodshed.